Much has been written about this classic 1985 film starring Michael J. Fox, Christopher Lloyd and Lea Thompson so rather than review the film, I plan to examine why it has remained popular 32 years after its initial release. Enjoy my take on Back to the Future (1985). Anyone walking out where will have heard people talk about a nostalgic callback to the good old days. What if you could go back and change the things that have gone wrong in your timeline? In the case of Marty McFly, it’s that his father George (Crispin Glover) never stood up to the high school mean guy, Biff (Thomas F. Wilson). Marty’s parents, who had a promising start in 1955, became accustomed to living lives of quiet desperation under the thumb of a brutal dictator. When Marty goes back to 1955 he sees a chance that any of us would take, the chance to educate from hindsight. Marty seeks to help the man he desperately loves stand up for himself thus empowering him to do better and, indeed, when he returns life has changed in the McFly household. Isn’t that the dream? They script, written by Robert Zemeckis and Bob Gale, is very much a time capsule to both the 1980s and the 1950s. In the 1980s, the characters have the big hair and puffy vests so prevalent in the day. In the 1950s, the style is poodle skirts, bobby socks and white tee-shirts. There is a commonality in the restrictions of each decade. Authority figures are still high on power and the bully remains the same. With Biff, we see the progression. He starts as a kid that likes to get what he wants and gets joy out of the humiliation of others and grows into a sadistic jerk for whom cruelty and torture are daily life. What is organic about the characters also makes them timeless. George has potential that has literally been frightened out of him, Lorraine is the mother with the potential to be nurturing but has been fighting all of her life to stay afloat. Marty wants so desperately everyone to be better and has the luck to witness his parents before their spirits were crushed. 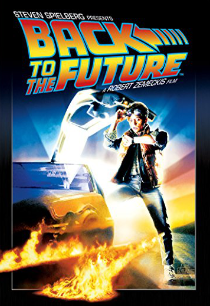 Back to the Future fulfills an adult fantasy of going back in time and fixing the key point mistakes in our lives, with all those keys of “what ifs.” In Marty’s case, he was the key to overpowering is parents and changing his own future. Back to the Future was initially rejected by Disney because they felt that Lorraine’s attraction to Marty was an inappropriate theme but the end result was a wonderful movie appropriate to share with the younger members of any family. If you have not seen this great movie in a while, pick it up and watch again.